It’s time for the U.S. to start taking in more Syrian refugees. 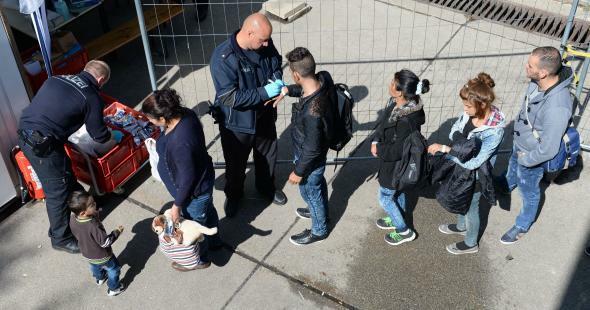 Refugees wait to be processed by police in Deggendorf, Germany, on Sept. 8, 2015. Due largely to geography, most of the attention on the migrant crisis in the Middle East is focused on just how many refugees European countries are willing to take in. But with the problem worsening, the United States might also have a part to play in alleviating one of the world’s biggest current humanitarian disasters. The U.S. caps the number of Syrian refugees it takes in per year at 1,500, with an overall limit on refugees of 70,000. That’s minuscule compared with the 800,000 Germany is preparing to take in this year, not to mention the millions living in camps in neighboring countries in the Middle East. Asked whether the U.S. was considering raising the cap on Syrian refugees, White House spokesman Josh Earnest dodged, pointing to the billions of dollars the U.S. has donated to improving migrant camps in Europe. Still, the idea of raising the cap is reportedly under consideration. The question comes amid a fractious debate in Washington over U.S. immigration policy generally as well as concerns about terrorist attacks in the United States. Critics of refugee resettlement have pointed to a case involving an Iraqi man who had worked as a translator for U.S. forces in Iraq before being accepted as a refugee here and was recently arrested in Texas on charges of aiding ISIS. The Guardian recently polled all 22 presidential candidates on the issue. Only former Maryland Gov. Martin O’Malley unequivocally called for the U.S. to take in more refugees. Ohio Gov. John Kasich and GOP pole-setter Donald Trump suggested that they might be open to the U.S. accepting a few more. Hillary Clinton and Bernie Sanders didn’t respond. Wisconsin Gov. Scott Walker suggested the U.S. shouldn’t take in any more refugees until it deals with the threat posed by ISIS, a stance that doesn’t do much for the millions already displaced by the conflict. As the AP notes, the U.S. took in many more refugees from previous conflicts—1 million from Southeast Asia after the war in Vietnam, tens of thousands of Kosovar Albanians in the late 1990s, and 50,000 from Iraq that war. But this time around, despite escalating U.S. military involvement in the conflict in Iraq and Syria, there doesn’t seem to be the same sense of responsibility on behalf of American policymakers or the public. The U.S. isn’t the only non-European country starting to wrestle with the issue. Along with announcing it would join airstrikes against ISIS this week, Australia—a country with extremely restrictive asylum policies—announced it would take in an additional 12,000 refugees from the Middle East. Venezuela, whose president, Nicolas Maduro, is a supporter of Syrian President Bashar al-Assad’s brutal regime, has also offered to take in 20,000 Syrian refugees, an announcement timed oddly to coincide with Venezuela’s mass deportation of hundreds of migrants from neighboring Colombia. Canada has committed to resettle 10,000 people over three years, but the program has been moving slower than expected. The family of the Aylan Kurdi, the young boy whose body was photographed washed up on a Turkish beach last week and whose death instantly became the global symbol of the crisis, was headed for Canada. The wealthy states of the Persian Gulf have been heavily criticized for keeping their borders completely shut to refugees, even as they’ve been increasingly involved in the conflict in Syria. While individual citizens of these countries have donated extensively to humanitarian relief for refugees, their governments fear a threat to stability from a major influx of foreigners. Israeli Prime Minister Benjamin Netanyahu, whose country is the only one bordering Syria that has not taken in refugees, has rejected calls from the main opposition party to provide refuge, saying the country is too small. Right now the overwhelming brunt of the crisis is being borne by Lebanon, Jordan, and Turkey, each of which have taken in more than a million people. Syrian refugees now account for roughly 1 in 4 people in Lebanon. This is not a sustainable situation, and sooner or later, other countries—not just Europeans—are going to have to step up. Read more of Slate’s coverage of the European refugee crisis.